I will talk more about this in a future video on My 1-2-3 Cents on YouTube, but since I'm going in order with my Mania Memories blogs, I figured I'd write about it too. 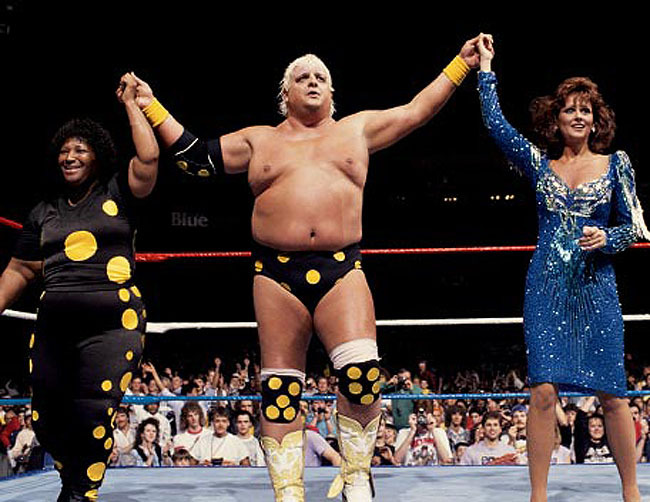 I think Wrestlemania 6 may (and I repeat may) have had the biggest main event in the history of the extravaganza. I'll go into further details in the vlog, so save your comments for then. 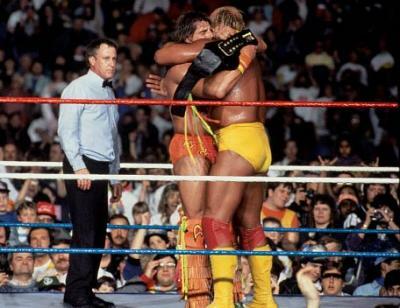 Hulk Hogan vs. the Ultimate Warrior was the first time the WWF ever pitted two baby faces against each other in the main event of Wrestlemania. It was also the first time (I believe) that there was a title vs. title match. I know in the past world champs had faced Intercontinental champs, but only the world title was on the line. Someone correct me if I'm wrong. Back then I was a much bigger Hulkamanic than Warrior fan. I can say that has since changed. While the contest between the two won't be remembered as a scientific classic, it was an attempt to change the guard. Depending on who you believe, Vince McMahon was looking for a new torch bearer. He evidently thought the Warrior was the guy to do it. And let's be honest folks, the Warrior may not have been the best in the ring, but he was a great showman. He was dedicated to the character and had a lot of intensity. He still does today, watch him on YouTube if you don't believe me. However, Warrior in the driver's seat didn't last long and Hogan came back from Hollywood and was soon again on top. One thing I never understood though was why they didn't book the rematch for Wrestlemania 7. Like I said, it wasn't a scientific matchup by any stretch of the imagination, but it would have been a better main event than Hogan vs. Sgt. Slaughter. But that's for another post. Other significant events at Wrestlemania 6, it was the last Wrestlemania wrestling appearance for Andre the Giant. He and Haku (the Collesial Connection) lost the tag team titles to Demolition. Andre turned face afterwards, but never really wrestled in a WWF ring again. I know he had a match in Japan shortly after that incident, and I think that was pretty much it for the big man. He died less than three years later. "Rowdy" Roddy Piper also made his Wrestlemania return at 6. He battled Bad News Brown to a double count out while painted half black. It's still one of those moments that stands out to me when I think back on the history of Wrestlemania. This mania also marked the first pinfall loss on TV for Mr. Perfect. Brutus Beefcake defeated Curt Hennig, who would soon go on to win the IC title that the Warrior would have to forfeit. Dusty Rhodes wrestled in his only Wrestlemania at this one too. He and Sapphire beat Randy Savage and Sensational Sherri in a mixed gender tag match and Big Bossman beat his former partner Akeem in a really quick match that I thought would have gotten more time due to the fact that they were once friends. The feud that started a year earlier between Jake the Snake Roberts and Ted DiBiase also came to a close at this event as well. I always thought the two of them worked well together. 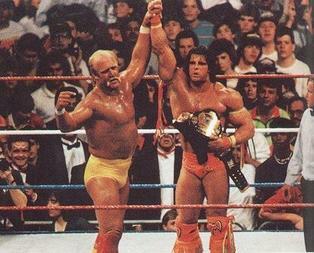 What are your memories of Wrestlemania 6? Share them here or on our Facebook wall.